This unit with the locking wooden key inserts in the doors is distinctive of the Mission Style. The Center will accommodate most 32\" televisions and VCR\'s. The TV is located on a pullout tray that is mounted on a swivel. The bottom drawers can be used to store videotapes, CD\'s, clothing or blankets. 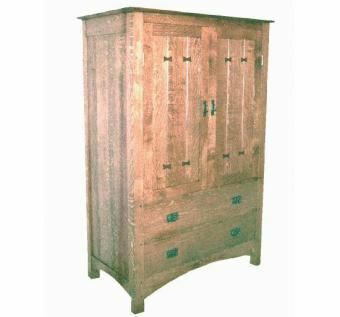 The unit is also available as an Armoire with clothing drawers in the upper section and an adjustable shelf.